Supplies to keep your endoscopes in top condition. One of the most important ways to keep your endoscope in good working condition, and to prevent the spread of contamination (such as viruses, bacteria, poisonous fluids, etc. ), is to regularly clean, sterilize and lubricate your endoscope and its accessories. ESS provides here some of the tools and materials for you to maintain your instrument for many years to come. Browse these categories under "CLEANING/MAINT." Veterinary Cleaning Products - cleaning products designated for veterinary-use only: Sponges/Brushes/Fluids; Vet Gas Sterilization; Pure Station (tm) Cleaning/Flushing System; Veterinary Rigid Sterilization Trays. Disposable cleaning brushes - ESS DCB Series: DCB-1.72306 & DCB-1.01202. ATT-01 Air Leak Testers is a hand-held leak tester that uses air to safely test your endoscope for leaks prior to soaking/cleaning. Available for Olympus, Pentax, Fujinon, Storz, Wolf & OPTIM endoscopes. 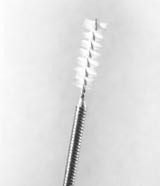 Reusable channel cleaning brushes by ESS - Brush assortment for biopsy channels sized 2.0mm~3.7mm. Silicone Oils for endoscopes and endoscopy instruments. Designed by endoscopy nurses, flexible scopes can be safely coiled for complete immersion in disinfecting solution in its 20" round, 6" depth tray. The lift-off lid completely covers the tray, limiting fumes. Max temp is 185°F. Made in the USA.